Ok, it’s not really a day in the life….it’s a little longer than a day. A day would only give you a tiny glimpse of what goes into creating flowers for a wedding. So I’ve split it up into a few blogs. Preparations for us start many months before the big day and then several days of preparing the arrangements on the actual week of the wedding. After the initial consultation we often send several emails and revised quotes in the months leading up to the wedding to include any little changes or big changes as the case may be to ensure the bride and groom get exactly what they want. Nearer to the wedding, details like final numbers for buttonholes and delivery times are confirmed. A few weeks before the wedding we get going with the boring numbers part… spreadsheets. We calculate how many flowers we need for every bouquet and arrangement. This part is the least exciting part of wedding preparations. But we know soon enough we will be knee deep in scented gorgeousness, and the spreadsheets really help us see at a glance how many of each flower an arrangement is allocated. Of course this isn’t an exact science; flowers have a tendency to vary in size, so we always order some extra. We then check with our suppliers that there are no problems with the availability for any of the varieties we need. Very occasionally growers just decide to stop growing a lovely rose or Mothers day abroad means certain flowers are in short supply. 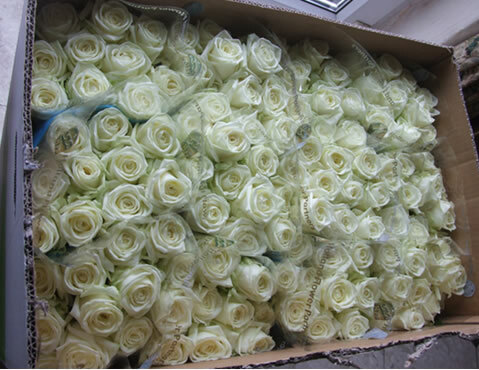 Once we are happy everything we require is available we place the order with our supplier, ordering the flowers to arrive early in the morning a few days before the wedding. Last weekend I had the pleasure of providing flowers for a Chinese wedding, and attending it, as the bride and groom are friends. The couple had a traditional English wedding on Friday and a Chinese celebration on Saturday. The bride had picked a fabulous colour scheme of turquoise and cerise which was followed through with the wedding flowers. Friday’s festivities were formal, as is English tradition. The reception room was complete with table plan and crisp white chair covers, everything perfectly co-ordinated with the wedding colours, from the chair sashes to theatre style spot lights. The Chinese banquet was a more informal affair. No table plan to direct guests to specific seats, a relaxed outlook to the arrival time and a riot of colours including red, yellow, gold and cerise. On the way into the wedding, guests all signed an embroidered red piece of silk with messages of good luck. 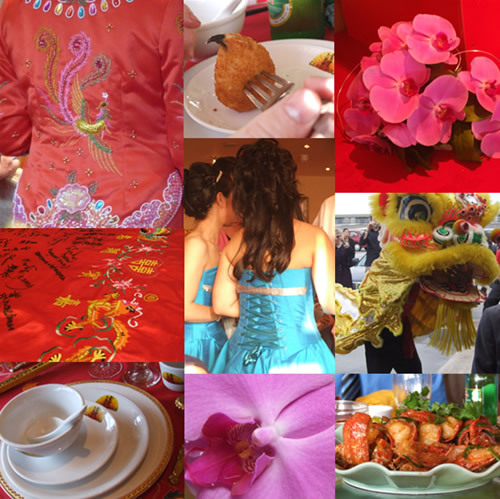 Red is an extremely lucky colour to the Chinese and it is used in many places at a Chinese wedding. The bride wore a beautiful red dress embellished with gold embroidery and red flowers in her hair. 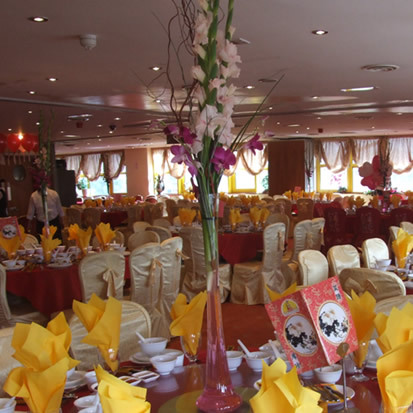 Wedding gifts of money were presented in red envelopes and the head table dressed in red table linens. All the floral arrangements were cerise and pink. The wedding flowers featured over 100 stems of cerise Singapore Orchids as well as Gladioli, Roses, Asiatic Lilies and Gerberas. Large pedestal arrangements welcomed guests at the entrance to the wedding. Tall vase arrangements decorated the tables with pink Gladioli, Orchids and willow with pink tinted water. Before the meal started we were treated to an amazing lion dance and Chinese firecrackers. Drums and gongs accompanied the dance, the loud sounds are said to drive away evil spirits. The Lion then followed the guests into the banqueting room and performed a dance where it stands up and eats greens hanging from the ceiling with a red envelope, it spits the greens out around the room to symbolise spreading wealth. The bride and groom then took part in a tea ceremony where they knelt in front of the groom’s parents and served them Chinese tea as a sign of respect. The banquet consisted of nine main courses plus rice, noodles and deserts. 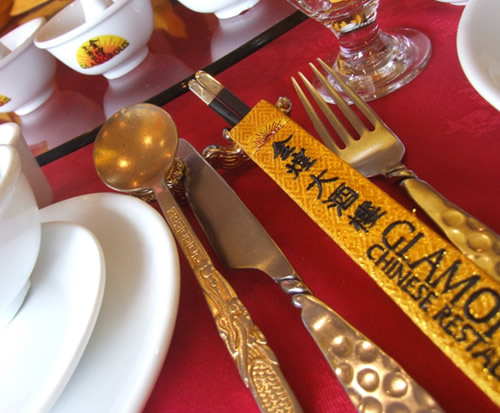 Chinese food has special symbolism and each delicious course had its own meaning. Roast Chicken was served which means phoenix and wishes the newlyweds a prosperous life. Lobster is called dragon shrimp in Chinese. So the Lobster and chicken at together indicated the harmonious relationship between the dragon and phoenix. In marriage the dragon symbolizes the male role and the phoenix symbolizes the female role. Our table was excited to try some of the more unusual delicacies such as jellyfish and stuffed crab claws. Desert was fresh fruit and Cantonese sweet bun with lotus seed paste fillings which wish the newlyweds a sweet life. During the meal the bride and groom went from table to table with their family to toast all the guests and thank them. Everyone thoroughly enjoyed the day’s festivities and the wonderful banquet. When the day had come to an end the bride and groom stood with their family in line to thank the guests and wish them well.